Guitar Training Session - Blues Solos & Improvisation (GUITAR, Coursebooks, P. Oldman & J. Fredd). By offering you the possibility to practice blues improvisations, this coursebook teaches you how to solo in this very particular style, letting you perform in a musical environment which simulates actual group situations. 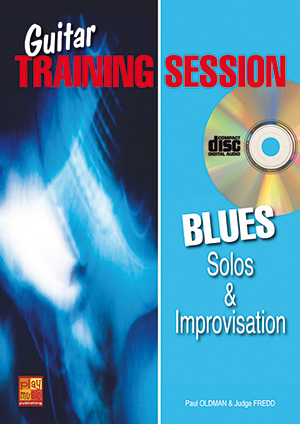 The enclosed CD contains 12 complete backing tracks (drums, bass & guitar) to which, as a beginning and intermediate guitarist, you can learn to play the numerous solos proposed in this coursebook contextually appropriately and, as an advanced intermediate or advanced guitarist, you will be able to play personal versions freely in many different blues styles. Thus, while some of you will simply discover the pleasure of playing superb blues solos, others will use the ideas presented in this coursebook to further their personal style and improvisational skills. The songs in this coursebook feature varying difficulties and cover diverse blues directions, such as Classic Blues, Boogie, Texas shuffle, Rhythm ‘n’ Blues or Slow Blues. Armed with this level of knowledge, you are fully prepared to meet all foreseeable future challenges.